For this evening, at the Chapel in the Holy Child Jesus Leonard Center in Richmond Hill, Queens, I was at Mass in a Foreign language. The language is called English, which sounds unusual as I usually am at the Tridentine Latin Mass at Holy Innocents in Midtown Manhattan. But the gathering was intimate, amongst the Brothers of Ancient Order of Hibernians Queens Division 14, as it was the Biennial Installation of Officers Meeting. I usually face Liturgical East along with the Priest who does the same. But this evening, The Priest faced Us(Versus Populum). But, it was the Mass. 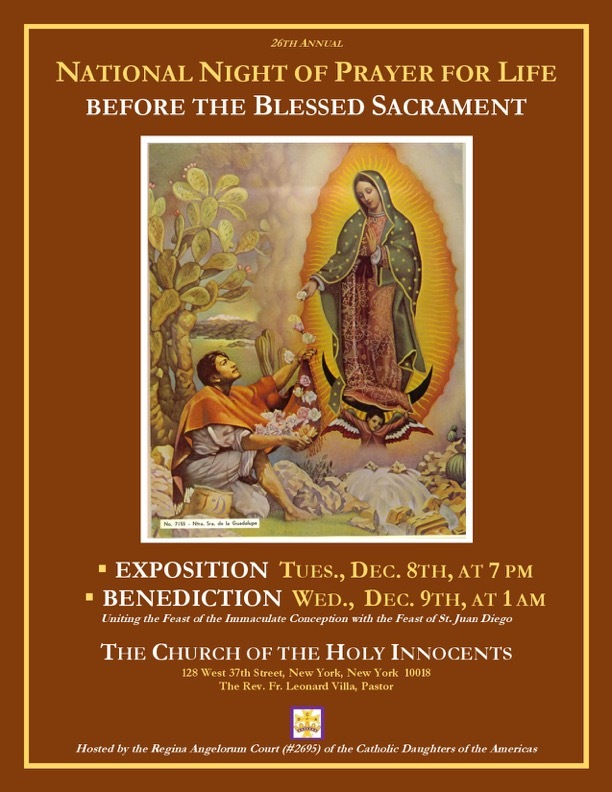 In anticipation of The Feast of Our Lady of Guadalupe, a new feast, promulgated by Pope St John Paul II, St. Juan Diego, was offered this evening by the Very Reverend Father Francis Shannon. The Brothers gathered for a Meeting and Installation of Officers, followed by a Repast. Happy Advent & Happy Christmastide! Yes, I did cross That part of The Atlantic Ocean called the East River for The Holy Sacrifice of The Mass, where the Priest faced Liturgical East. I was on the East Side(St. Agnes) yesterday(Sunday) for a Glorious Missa Cantata Tridentine Latin Mass. Ecclesia Dei Brooklyn has two Sunday Tridentine Latin Masses, with one in Park Slope, Brooklyn and the one I frequent at St John’s Chapel at St John’s Cemetery in Middle Village, Queens. The one in Queens has something of a St. Agnes East 43rd Street Flavor, especially with short Main Aisles for Procession and the Music Tones. During one such Mass, a Latino Priest who offered the Mass at St Agnes, also offered the Mass here in Queens. That same Priest offered the Palm Sunday Mass in the Ordinary Form. The 5:15 Sunday Mass was done in 1 Hour 20 Minutes. The STAGS are The Pros at Liturgy. So, while St. Agnes had a Well Done Novus Ordo Mass with Schola Cantorum, I chose to go to the Tridentine Latin Mass at Holy Innocents on West 37th Street, who also had a Schola Cantorum. The Celebrant at Holy Innocents was The Redoubtable Father George W. Rutler. Tonight’s Gospel According to St. Luke, proves that the Hail Mary is biblical, as it was in the Gospel Passage(Hail, Full of Grace, The Lord Is With Thee, was spoken by Mary’s Cousin Elizabeth, Mother of St. John The Baptist). Fr George Rutler spoke about the Miracle of The Immaculate Conception as a Mystery. He said that we have brains but only use a small percentage of The Brain. Yet, even if we utilized all of the brain, we still could not truly comprehend the Mystery of The Immaculate Conception. The Mass was packed at Holy Innocents. The last time I had been at Mass in Latin on a Weekday was in 1963 in the Cypress Hills-City Line Section of Brooklyn, which is 51 Years Ago. Fifty Years Ago, in that Brooklyn Neighborhood, the Tridentine Form Mass was part vernacular, with the Offertory and Consecration prayed inaudibly in Latin. Another thing, is that the Roman Catholic Schools of The Roman Catholic Diocese of Brooklyn were closed on that day. The same could be said for all Dioceses in New York State. Moms stayed Home. But the Tridentine Latin Mass is making a major cornerback. It has returned to the various Parish Churches. The Modernists have it “Bass Ackwards”, as The Mass is a Sacrifice, made by Christ Himself to The Father, with the Priest acting “In Persona Christi”, as “Alter Christus.” It is NOT a Memorial Meal, as the Protestants and False Ecumenist Practitioners would have it. The True “Mysterium Fidei”(Mystery of Faith) is that Bread and Wine become the Body and Blood, Soul and Divinity of Jesus Christ. It takes a Priest to do it. We are, as The Faithful, there to pray, but we are Laity and have not The Power of Christ. At 5:10PM at St Agnes on East 43rd Street(Venerable Archbishop Fulton J Sheen Place), Ordinary Form Extraordinary Version with Schola Cantorum, hence a Novus Ordo Missa Cantata, occurs. At 6:00PM at Holy Innocents on West 37th Street, Extraordinary Form Mass(Missa Cantata) also called The Tridentine Latin Mass is being offered with Schola Cantorum. As I had considered St. Agnes, I was there yesterday, but I am headed for Holy Innocents for Feast of The Immaculate Conception, as this would be the 1st Weekday Celebration of The Feast Day in Latin in 51 Years, the last time being in 3rd Grade in Brooklyn, NY. Last Year, when The Feast fell on a Sunday in Advent, the Tridentine Latin Mass was celebrated on Sunday, December 8th, 2013, while on the Ordinary Form Calendar, the Feast was transferred to Monday, December 9th, but not as a Holy Day of Obligation, only as an optional Holy Day. Byzantine Rite Catholicism according to the Julian Calendar, Sunday December 8th is in their Celebration of Nativity Fast, as well as a Sunday After Pentecost. It is Sunday, December 21st, 2014(Gregorian Calendar), with Feast of The Immaculate Conception transferred to Monday, December 9th(Julian Calendar), or Monday, December 22nd, 2014(Gregorian Calendar). Sancta Maria Semper Virgine, Ora Pro Nobis!